And while the sentiment probably wasn’t intended to inspire us off roading enthusiasts, it holds true nonetheless. Off-roading and 4×4 adventuring is an inherently social activity. Not only is it wayyyy more fun to shred through the mud and traverse through rocky terrain with your buddies, but having friends with whom you can enjoy your off-the-highway activities will allow you to stay safe and learn from others who have more experience on specific trails and problems. With this in mind, we’ve compiled a list of the 4 best off-roading meetups that you NEED to attend if you live in the Colorado area. 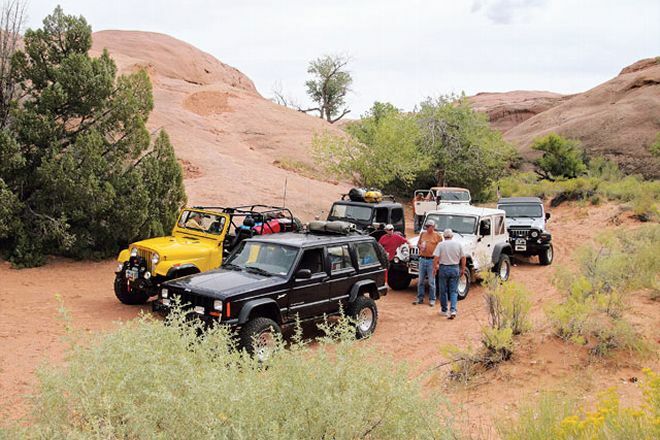 These groups are filled with experienced, high-caliber off-roaders who are eager to meet new people and share their expertise with fellow enthusiasts. Show up with a smile, ears to listen, and (maybe) a 6-pack of your favorite craft brew and you’ll fit in just fine! If you’re interested in meeting and connecting with other Jeep enthusiasts who share your passion for off-roading than the “Built 4 Fun” group will be right up your alley. The group holds different events that cater to novice and experienced drivers alike and, with more than 300 regular attendees within the group, you’re bound to learn a few tricks and tips you’d never previously considered. The rules of the group are simple. Only Jeeps allowed (duh). Bring as many friends as you like. Runs are awarded on a first come first serve basis so be sure to RSVP and arrive early. Leave your ego at the door. You must have a CB radio (no walkie talkie’s allowed). Bring your own form of air recovery. And more than anything… HAVE FUN! You can learn more and sign up for the group by clicking here. If you’re looking for a great meetup that isn’t vehicle specific, then Colorado Rock Crawlers is your place to be. The group regularly plans amazing day trips, overnighters, and even some longer expeditions for the more enthusiastic among you. The admin team will provide all members with details about the runs, rig limits, and “recommended” vehicle specifications to ensure that the trail runs go as smoothly as possible. Be sure to fully fill out your bio within the Colorado Rock Crawlers community with rig specs, experience, and special skills since the admin team will not allow you to sign up for any of the advanced runs without this information! These guys are an absolute blast to crawl with and have some of the most skilled and contagiously passionate off-roaders in the entire state. If you’re in the area DEFINITELY check them out. The name says it all. The RocOn4x4 group is a tight knit and highly active group that caters to off roading enthusiasts of all backgrounds and skill levels. Tackling a wide variety of trail types and difficulties, RocOn4x4 has an abundance of offerings allowing you to choose the runs that will best suit your abilities and interest. The group is filled with experienced mechanics and spotters who come equipped with plenty of gear to keep their members safe and keep the good times rolling. One of my favorite parts about this group is that they encourage their members to actively suggest runs and events, so if there’s a specific trail that you’ve been dying to tackle with some friends, chances are good that the RocOn group will be happy to oblige. There’s a small $12.00 membership fee for new members (which is returnable if you participate in a run and decide that the group isn’t for you) and you’ll need a full sized vehicle (no ATV’s or trail bikes allowed) in order to participate. You can learn more and sign up by clicking here. If a normal day trip off-roading isn’t enough to satisfy your thirst for adventure, then the Rocky Mountain Overlanding group is what you’ve been looking for. Overlanding is a style of off-roading where adventurers band together and travel to a remote destination to enjoy an extended period of camping or wilderness living before returning to the “real world” and the Rocky Mountain Overlanding group are the kings of this domain. Although they predominately organize 1-2 night trips, they’ve been known to venture out for longer periods of time (if that’s your thing) and are, by far, one of the most fun an exciting groups to join in the Rocky Mountain area.